This was the kind of game that locked-in Tournament teams cannot lose – no matter the lack of depth or an off-night or whatever circumstance, that is the kind of game that top teams find a way to win. This result got the TCU fan base steaming mad, ready to cancel the season and throw out the current roster and focus all available TCU sport love to the baseball team. Since when do we give up when we’re backed into a corner or when the odds are long? (Here? Here? Here? Here?) First: chill out. Second: read the Midweek Musing. Third: take a look the damage this loss actually did to the resume….basically none. Look, I was right there with the frustration and thoughts that the Bubble had been popped. 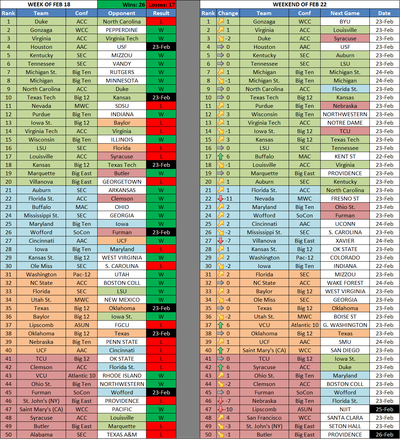 But stepping back from that emotional response, you’ll see: NET sent TCU tumbling exactly zero places in the ranking, no Bracketologist removed the Frogs from the tournament field or even into the “Last 4 In” category, and TCU still sits in the Top 50 of every ranking system. Of course you do not want to lose games you are expected to win, but this was a Q2 road loss, hardly a season killer. This loss did erase some of the margin for error, so a win in Morgantown next week is necessary and any other win would put some distance between the Frog resume and other Bubble hopefuls. 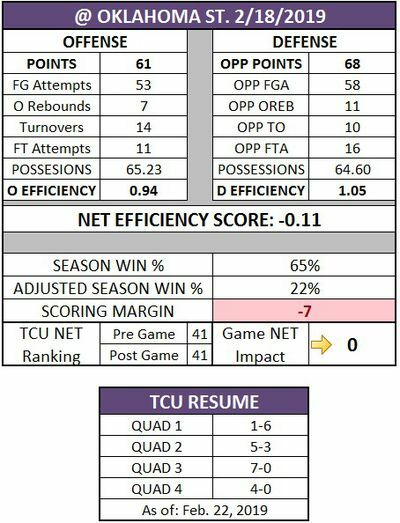 To be fair, this time last season TCU was #22 in KenPom, so this season will require a different path to reach the Madness. TCU still has four Q1 opportunities ahead, each a chance to erase the negativity taken on during this losing streak. The first of these key contests against top-level competition comes Saturday against #14 Iowa State. TCU’s victory over the Cyclones in Ames is the crown jewel of the Frog resume to date and a season sweep would be impossible to ignore for NET and the Committee. ISU was looking like a potential contender to the Big 12 throne after bouncing back from the home loss to TCU with a road win over conference-leading Kansas State, but promptly allowed Baylor defeat them back in Ames. So, the Cyclones will be coming in mad, motivated, and ready to quickly silence the Scholly. ISU will come out swinging, TCU will need to be able to take the Cyclone punches and keep standing. · #27 Villanova (↓7) vs. #69 Georgetown (↑10) – Mac McClung and Jessie Govan were flames to reintroduce the Hoyas to the Bubble campaign with a convincing upset of their rival Wildcats. It’s hard to believe Nova could fall into the Bubble zone, but losing three of their last four has them slipping. If they can’t go earn a win in Cinci over #89 Xavier before the massive showdown with Marquette on Wednesday the Wildcats could be in a fight for an at-large spot. · #49 St. John’s (↓3) vs. #73 Providence (↑12) – The Red Storm either need to climb the NET ladder or just come crashing down…getting swept by a Providence team that is on the lowest end of the Bubble is the kind of resume blemish that is hard to wipe away. Providence is certainly on the outside of the Tournament field at the moment, but with three Q1 opportunities remaining they could certainly rejoin the conversation. · #22 Nevada (↓11) & #47 Lipscomb (↓10) – This is the pain of the NET for mid-major teams – The Wolf Pack lost by eight at #135 San Diego State and the Bisons fell by six at #229 Florida Gulf Coast. There is no margin for error when the level of competition is so low, so these high-performing mid-major teams are constantly on the edge off falling off the NET cliff. Nevada will likely be fine, if perhaps dropping a seed line, but Lipscomb could be at risk of falling out of at-large favor. The A-Sun Tournament will be some of the most high-pressure basketball before the Big Dance. · #51 Alabama (↓1) – after losing to Texas A&M on a buzzer beater at home back in January, the Tide fell again to the Aggies in College Station, dropping below .500 in SEC play and into First 4 Out territory. If Alabama cannot defeat #132 Vandy at home this weekend, their Bubble will be popped for good. · #48 San Francisco (↑4) – The Dons had been trapped at #52 since February 8, but with a meaningful win at BYU, SF has jumped back into the Top 50. I still think the non-Gonzaga WCC teams have a lot of work to do to earn an at-large bid. At this point, if the Zags win the conference tournament, they would likely be the only WCC team in the field.